Recently my guild was privileged to host Jenny Balfour Paul, a world expert on the history of indigo and its use by different peoples. That history is a global story of chemistry and dyes that goes back at least 6,500 years. 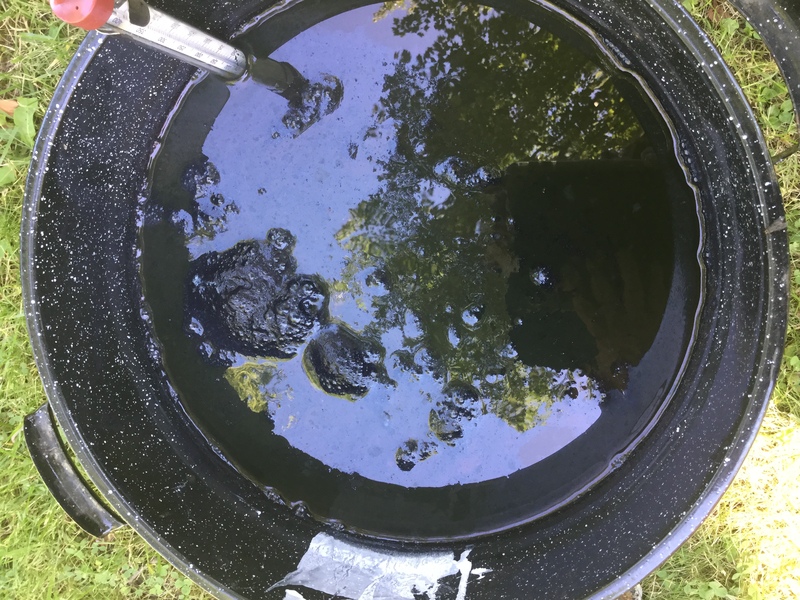 “It’s unbelievably ancient this dye. All the other dyes change. Indigo is always blue,” she said. Balfour Paul’s lifelong study of indigo started mainly by chance as a project to document vanishing traditions so that when the time came they might be revived. 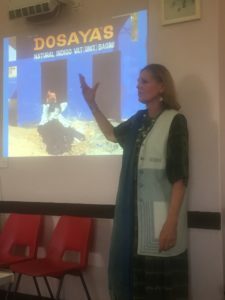 Her work has taken her to Yemen, India, China, the Marquesas Islands and beyond. “My life has been guided by a molecule. It’s a perfect molecule. Without indigo there would be no natural blue dye,” she said. But indigo’s story also has a dark side linked to slavery and exploitation, which in some areas is holding back its revival as an environmentally friendly alternative to chemical dyes. Balfour Paul does not shy away from this part of the indigo story, which she sees as the second part of the indigo tale. The first chapter in the indigo story is—broadly— the incredible story of how indigo pigment, invisible in its host plants, was detected, extracted and used by humans in the first place. Indigo shows up in different plants around the world. It’s the same molecule, but in Europe it’s found in Woad, in Japan it’s polygonum and in Mali it’s Lonchocarpus cyanescens. How did humans happen upon this miracle molecule? No one really knows. 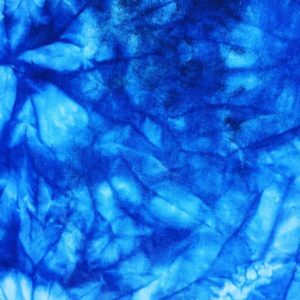 What we do know is indigo dyeing traditions developed worldwide and many of them have since vanished. Or in the case of indigo dyeing in Yemen, it’s literally being bombed out of existence. The middle of the indigo story is enmeshed with slavery and exploitation in the US, the Caribbean and India. In the US, indigo was introduced into colonial South Carolina in 1740 where it was grown on plantations by slaves. It became the colony’s second-most important cash crop after rice. Jamaica’s first colonial crop was indigo, again grown on plantations by slaves. In India, farmers were forced to grow indigo and workers’ conditions were appalling. Indigo was big business and in 19th century half the exports from Kolkata were indigo. That all came to an end in the early 20th century as synthetic indigo had almost completely replaced the natural pigment by about 1914. Indigo has struggled to overcome its cultural baggage particularly in India, says Balfour Paul. She is optimistic however that the page has turned for indigo. “Now it’s a story about revival and environmentally friendly dyeing,”she says. In El Salvador indigo is now vacuum packed or canned as a paste. The revival of indigo in El Salvador being used by Gap, Levi’s and Benetton for baby clothes, because they know synthetic indigo is toxic, said Balfour Paul. In 2013 Levi’s 511 collection featured organic, indigo-dyed jeans. People really need one pair of organic jeans, not 10 from discount retailers, says Balfour Paul. Jamaicans are revisiting indigo and in Kolkata and throughout Bengal there are efforts afoot to reintroduce natural dyeing. Jenny Balfour Paul continues to follow the indigo molecule. She is now working now with Dominique Cardon—another natural dyeing superstar— on the Crutchley Archive at the Southwark Archive in London. “In 1740 they could colour match as well as any modern dyer. The archive is full of dye recipes,”Balfour Paul said. I personally can’t wait to see the fruits of their work. It’s bound to be fascinating for any student of natural dyeing. Obviously I’m really jealous you got Jenny Balfour Paul to speak at your guild. So many questions! But what is this “synthetic indigo is toxic”? Synthetically derived indigo is exactly the same molecule. Is she talking about the extraction process? In her book Indigo: Egyptian mummies to blue jeans, she details different extraction methods of natural indigo from various cultures— a lot of them were both environmentally toxic/ hazardous to the worker’s health. Did she mention in her “revival of tradition” how these aspects were being mitigated? Sounds like it was a great talk! She didn’t mention any efforts specifically, but there are some afoot to develop greener ways of extracting indigo. I would guess they would be along the lines of this study at Berkeley. Does your guild have her contact info? Maybe you could ask her some follow-up questions? I think clarity on processes is really important. People automatically assume “natural dyeing” is less toxic than using synthetic dyes, but it’s not necessarily the case. I think specifics would be worth asking about!